Single mode fiber cable common type is usually SMF-28e glass. Singlemode fiber cable indoor type is usually with a yellow color jacket so that it is easy to identify. We usually use SMF as the short form for single mode fiber cable. 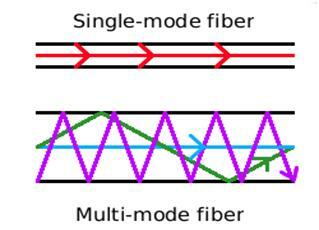 Single mode fiber cable is used for long distance data transmission, on the contrast, multimode fiber cable is for short distance data transmission, but multimode fiber cables are generally more expensive than single mode fiber cables. 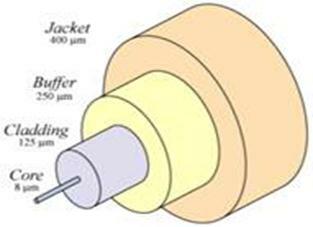 Single mode fiber cable is usually 9/125 types or 8.3/125 types. Here the 9 and 8.3 refer to the diameter of the fiberglass core, and 125 refer to the cladding diameter, this is the reason why when we see the single mode fiber cable, whether it is 9/125 or 8.3/125, sometimes they can be with same overall cable diameter. Single mode fiber cable indoor type including the single mode fiber cable used to make patch cables, the diameter is usually 1.8mm, 2mm or 3mm, these cables are round type, there are also ribbon single mode fiber cables. Single mode fiber cables from FiberOpticCableProducts.com are fully compatible to international and industrial standards. We offer single mode fiber cables with competitive prices and fast delivery.